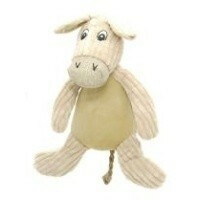 Danish Design Doris the Natural Donkey Dog Toy is a beautifully plush toy that your dog with love to play with. Made from the finest and softest plush corduroy, this adorable little donkey will not only win over the attention of your dog, but their heart too. Great for a whole variety of games with your pooch, this luxury toy character is the perfect friend for your pet! Toy measures 15" in size.